Can the Firefox menu bar be hidden? 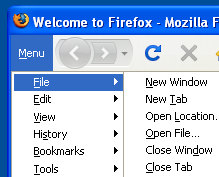 As a recent convert to Firefox I'm still trying to customize my environment. I'd like to hide the Firefox menu bar. I see options for hiding the navigation bar and the bookmarks tool bar, but nothing for the menu. Full screen mode effectively hides the menu bar, but I would still like to see the other tool bars. Yes, you can use this add-on: Hide Menubar. If you don't want to have to press Alt all the time to access the menu, I use Tiny Menu. Not the answer you're looking for? Browse other questions tagged firefox browser-addons fullscreen or ask your own question. Full Screen Firefox — show bar at the bottom? View menu bar & bookmarks toolbar in Firefox 4 full-screen mode? Is there a firefox add-on that will allow me to “hide” my bookmarks? Is there a keyboard shortcut in Firefox to toggle viewing the tab bar in full screen mode? Can I get fullscreen in Chrome to work like it does in Firefox? How can I disable animations in Firefox when going full screen?